Troop 50 scored on a double this week when Davis Tullier and Kyle Sullivan both passed their Eagle Scout Boards of Review. Both scouts are founding members of the troop and now join the nine other Eagle Scouts in the troop's Eagles' Nest. In addition to earning their Eagle rank, Kyle and Davis are graduating from Auburn High School this week. This makes a total of seven Troop 50 Eagles who are about to graduate from Auburn High. The future looks bright for our Eagles as they look towards college and other endeavors. We wish them well along their way. Davis celebrates with his family following his board of review. Kyle is joined by his parents in celebrating his Eagle rank. Davis and Kyle started Cub Scouts together in Pack 13 and earned their Arrow of Light as Webelos in Pack 29 before transitioning to Boy Scouts. They were both elected to membership in the Order of the Arrow at the same time and they helped to establish Troop 50 in 2012. They were members of one of the troop's first patrols, the Average Joe's, with Kyle serving as the first patrol leader. In the following term, Davis became the patrol leader and Kyle took on the job of his assistant. Considering their longtime friendship and parallel scouting careers, it is appropriate that they advance to Eagle together. 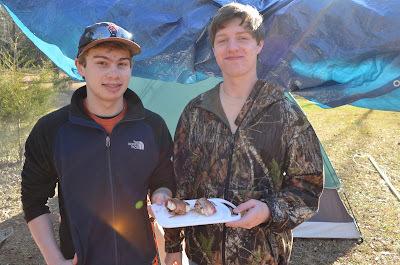 at the District Camporee in March 2013. Davis began work on his Eagle Service Project in the summer of 2014 at Pick Elementary School. Although Pick is a new school in the Auburn school system, the principal, Debbie Brooks and the P.E. coach, Chuck Cooper, were at Cary Woods when Davis was in elementary school. For his project, Davis constructed a trail leading from the parking lot down to the creek that runs between the school and North College Street. 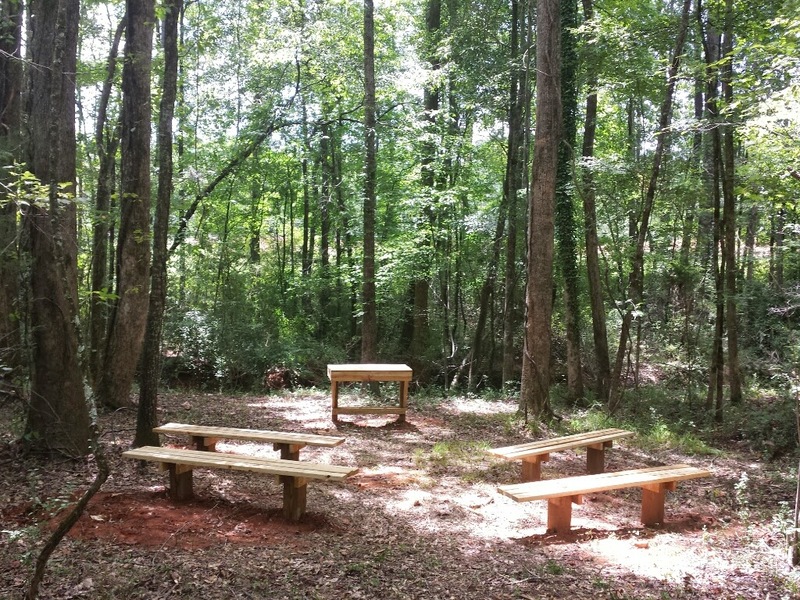 Beside the creek, he built an outdoor classroom consisting of a table and four benches. Teachers are now able to bring students out to the creek for lessons in biology and the environment. The project was the subject of the blog post "Trailblazing toward Eagle" with additional photos in our online photo gallery. 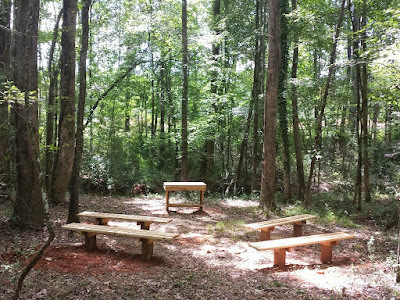 Davis' completed outdoor classroom in front of the creek. Kyle's Eagle Service Project was also completed at Pick Elementary and, appropriately, was situated along the trail constructed by Davis. Kyle's project was recently highlighted in our blog post "The gift of music at Pick Elementary." He created an outdoor musical classroom for use by the third through fifth grade students at Pick. The area includes a xylophone made from PVC pipes, a washboard, chimes of galvanized pipes, drums made from buckets and trash cans, and cymbals using the trash can lids. Kyle told the Eagle Board that the school's secretary informed him that she can always hear students enjoying the instruments when she heads into the parking lot at midday. Photos of the project can be found in the online photo gallery. The musical environment of Kyle's project. Davis and Kyle take their place among the more than 2.37 million scouts who have earned the rank of Eagle since the award was created in 1912. Since then, only two percent of all Boy Scouts have earned the rank. Although the percentage of Eagles in recent years has risen to six percent of scouts in a given year, the attainment of the rank is still a rare achievement among the almost 900,000 registered scouts in the United States today. All of our Eagle Scouts should be commended for their hard work. It should be noted too that Eagles whose fathers are also Eagle Scouts is a rarity. Troop 50 is proud to now have three sets of father/son Eagles as Davis earns the rank. His father, Michael, earned his Eagle in 1989. It is a legacy of which both can be proud. Father and son Eagle Scouts, Davis and Michael Tullier.